Depression, the most important public health issue in the world. 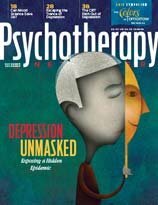 Do therapists have a responsibility to educate people about society's role in generating unprecedented levels of depression? Can Mood Science Save Us? It’s time to get beyond simplistic notions about “chemical imbalances” and finally reckon with how deeply rooted depression is in the uncertainties and false values of our 21st-century consumer culture. Life today is, in many ways, easier than it used to be. Therefore, shouldn’t we be less anxious than we once were? Depressed clients repeat the same thoughts, activities, feelings, and experiences again and again, as if entranced. Good depression treatment is largely about awakening them from this bad trance. Evidence continues to accumulate that many people with depression suffer bouts of it all their lives, even after a good response to therapy. So what if we give up the idea of cure and opt for the idea of management? While widely acknowledged to be the most empirically supported therapy ever invented, cognitive behavioral therapy (CBT) is often criticized for being too rigid and mechanical. Not so, say two of its foremost practitioners. Relapse prevention begins in the first session, when we tell clients that we want to help them become their own therapists. One of the most useful ways of understanding depression is the stress generation model, based on the idea that depressed people need better skills and resources for managing life challenges so that they don’t wind up feeling trapped and victimized in their own lives. The Ray Rice case evokes a discussion of the many faces of domestic violence. Enduring recovery from obsessive compulsive disorder means riding out the demands of an inner bully. Helping families heal cutoffs is painstakingly delicate work, with a high risk for stumbling over buried land mines. During the false memory controversies of the 1990s, many therapists saw Elizabeth Loftus, one of the most honored psychologists in the history of the field, as public-enemy number one. Research increasingly shows that screen time is no substitute for old-fashioned human contact. A daughter marvels as her mother goes from grief to an exuberant rebirth.